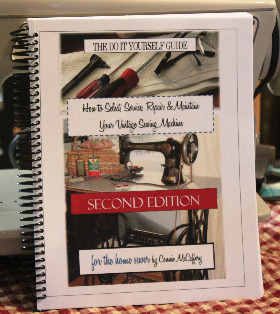 A Spiral Bound Version of the popular Sewing Machine Repair Book, Second Edition, is to be Released January 2017. In the new revised second edition, we've added more repair topics, done minor revisions and added an index, there's even a place to document your own machines. In full color, we now will offer this wonderful service manual with a spiral binding. which can fold all the way back upon itself and remain flat, providing for an easy reference while working on your vintage sewing machine.